As of June 16, 2018, the climb was in good shape. The snowfield at the start is rapidly shrinking, although you must climb over, under, and around some for the first 100 yards or so on terrain no harder than easy 5th. The layer of dirt discussed in some other reports was present but mild. The proper gully has a small waterfall with a gentle flow, which was very pleasant as the wind would provide us with random mists which smelled of sage from below. Hard to beat that! We followed the main gully and found mostly good rock. For what its worth, nothing came screaming down at us at any point from above. The loose plates were certainly present, but we found them quite easy to climb around. Our path eventually lead us up and over shattered red turrets which provided relatively solid rock for the vast majority of the upper slopes. We descended the north ridge, which we found direct and mostly pleasant, although the lower slopes certainly become a slog. I would echo what others have said: leave the rope in the car. We soloed the route, but I am certain a rope would have been a liability. Wear a helmet and pay attention to your surroundings. I found the climb to be an amazing experience, and believe some of the horror stories of choss oceans were overstated, as far as our path, at least. Saw a cool looking rib on the approach and decided to try it. Turned out to be a super fun scramble with good ridge climbing, exposure, views etc. Made a mountainproject page for it. Climbed this 10/20/10. Started at 8:15, topped out at 12:15ish and back in Mammoth by 3. Follow the trail past the John Muir Wilderness sign until you get to the creek bed, it will be very obvious. I found the route pretty straight forward, but headed right because of snow on route. Getting back to the car took forever. I didnt follow the ridge, because I found it easier to just run down the snow. Finally found the gully system and scree surfed forever, then did a bit of bushwacking and before I knew it I was at my car. Fun climb, did it solo, probably would have killed anyone below me with all the rock I sent down. Downclimb the N ridge of Laurel towards Convict Lake, staying directly on the ridge crest as much as possible. The downclimbing here is mostly class 2-3 and has better rock than the upper portion of the climb. Stay on the ridge, don't descend too early. As the ridge flattens and character of the rock changes, traverse right onto the steep, sandy slope. Hard to describe the best place to drop in, use your best mountain judgment. The upper slope is very loose, but funnels into an amazing, narrow scree gully. One of the cleanest, easiest scree-sprinting descents I've ever seen. The scree chute eventually peters out into a bushy drainage, follow this back to Convict Lake Trail. I was able to get from summit to trailhead in 1 hour 40 minutes. A few years back, winter conditions were just right. Prefect neve and some great water ice. If conditions are right I would highly recommend it. do, what a slog at the top! We had a great time on this route yesterday. The lower part still had quite a bit of snow. The lower canyon section was fun with quite a bit of water flowing. A rope was useful for hauling up packs. Less useful for climbing though. The compact nature of the rock meant that there was practically zero pro on the route. We had a few problems with dirty slabs (still early season) and rock fall. The slabs are heavily scarred with obvious rock impacts. The "long but easy" decent route is described as 4 hours and 10 miles. You would have to be running to do it this time. It's a beautiful hike, but it is a decent length day hike. The bridge crossing the river in the section below Mildred Lake is washed out. In this flow crossing the river at this point is not an option. Continue down the true right bank until you can cross via dead trees in the more mellow section. Add significant time for poor terrain. It's a very long fun day out. I climbed this route yesterday. It isn't much of a rock climb at all. It would either be a 1-star climb or a 3-star scramble. It's a beautiful location, great summit, easy approach... but it's also >50% choss and scree; and only about 5% climbing. It's like going up one and a half North Dome Gullies. Don't even THINK about going up behind other parties. It's impossible not to knock stuff off of this route. If you have a partner climb side-by-side or close enough together that the rocks can't pick up too much speed. And for goodness sake check the weather. That said I have nothing to add to the beta, which was good. The route is bone-dry right now but quite warm. I was glad to be descending by 10am. By the time I got to my car I was hot and cranky and surrounded by fishermen's wives who were obviously astounded that someone so close to fresh water could be so dirty. BTW, I had Cingular service on the summit. Called my girlfriend. I guess I'm not much of a soloist. Soloed the route 8-18-06, my first solo of this type of climb. I thought the route was really fun, and while there was plenty of bad rock, there was plenty of good rock as well. The climbing was very casual, and I don't see how bringing a rope would help as few places for pro existed. The Supertopo beta was perfect -- no problems at all during the ascent. Definitely take the time to scope the route from the parking lot. I got a bit off-course during the descent, which was rather unpleasant (extremely loose scree/sand gullies forever). I think I descended the wrong gully, or crossed over into the wrong one from the correct one. The base of the route had some patches of snow and ice, but they were easily avoided by climbing around them. As for the top, past the large red rock vein, stay to the left of a red dike that runs parallel to the gully and you'll avoid the 5.6R slabs/false summit. WEAR A HELMET. A few times I though I was in a shooting gallery as loose stones whizzed by. Just completed this route yesterday (Oct 27). It was raining and snowing all day with a few inches of accumulation above 9000 ft (esttimat). Ok, this route is very canyoneering like for the 1st 1/3 of the route and and fun. Most of the rock on this route was wet with water actually running down it (the weather played a factor BUT it is obvious that water routinely runs down the lower 1/3 of the route). The 1st section of 5th class rock at the very beginning can easily be ommitted by ascending the ledges to the right BUT I found the 5th class section to be only 2-3 moves of wet 5.2 that was fun. After that was the canyoneering stuff for awhile which was also fun. the section obove the redish rock area had several options. Going to the gully / gullies to the left worked good for me. Talus is abundant for a few hundered yards.the very, very far left gully will give access to very obvious ledges and a relief from talus. the ledges were fun BUT more exposed toward the top than the other 5th class section (wet of course) and NO places or options for pro. I seen this section described as "solid rock". WHAT A JOKE!!! There is NO solid rock oN this mountain. do not wast time and bring anything but slings if u decide to bring a rope. One could also take the gully next to the very left ledge gully which is just a continuation of talus to the top ridge line. Either way as long as u stay to the left above the red rock area either the far left or the one next to it are cool (talus vs fun exposed, rotten 5.3) and as long as u curve or traverse right toward the top of either of these gullies than you will hit the ridge. From there u head obviously left ond walk up talus to the top. The snow on the top ridge was up to 12 inches and still falling down which supplied some relief from the talus. Descent of the ridge all the way through manzanita type bushes was not to bad. Round trip with taking time to explore around was 8 hours. Oh, rockfall is an issue and i took a baseball size shot on my forearm which was covering my face. Close call but no injury. Expected for a MTN full of rotten rock. Overall a real fun climb. Climbed with H.H. on Saturday 8/21. Beautiful weather, perfect morning. Supertopo directions made the approach easy, though we went cross country at the first small creek bed, instead of going a few more turns up the trail to reach the wide dried up river bed. A bit of snow at the base of the gully, but as it is late season the route was mostly dry (a few slick spots but not a big problem). Found the route easy to follow, good fun on the slabs high up (sticky approach shoes helped). Trekking poles made the approach and upper scree slopes go by quickly. Good warm-up for Agassiz the next day. All in all a fun scrambling weekend. Descent- we stayed below the ridge line until the cirque was visible, then regained ridge, dropping down about 100 yards after the rock turned grey. climbed this route on 7/10/04. we did a variation above the second red band, and climbed a few pitches of 5.6X slab. despite the looseness of the scree and talus, we found the slabby areas to be solid rock. overall, I thought this was fun climb. the descent sucked though. Made a 2nd attempt on Laurel on Monday, July 5th. About half-way up the route (near the huge band of red rock), a storm hit. My partner and I made the decision to retreat, and we were happy with it. We had to leave some slings for a couple of rappels, but that was all. Retreating probably takes as long as climbing the route -- at least it did for us. In any event, this is a warning to wear a helmet on this climb. We happened to be off-route (about 100 feet east) at the point where the storm hit. On the actual route, a refrigerator-sized boulder fell a long way and broke into some pretty substantial pieces, falling straight down the gully. Obviously, a helmet is not going to do any good against such a large piece of rock, but it may have helped with some of the smaller pieces. Getting hit by any of those pieces without a helmet would have been certain death. We were lucky. Had the storm hit 15 minutes later, we could have been back on-route and in that area. The climb is a good one. The snow at the base of the gully is melting; it's soft enough for approach shoes by 8 or 9am, though there are a few steeper sections that made us step a bit more carefully. On the retrea, we built snow bollards and rapped off of them on the retreat, until the angle eased. Last weekend, I set out for what I thought would be a casual solo. It turns out the gully still had a significant amount of snow in it, which makes route-finding much easier. No problem, I thought, I'll just climb to the (climber's) right of the gully, directly alongside the snow. I wound up climbing hundreds of feet of, say, 5.4 - 5.7 (with no real opportunities for pro; since I was soloing, it didn't matter). The climbing is not difficult, but downclimbing it, of course, would be much tricker. There's some good rock, but also plenty of loose stuff, and some gritty sections. 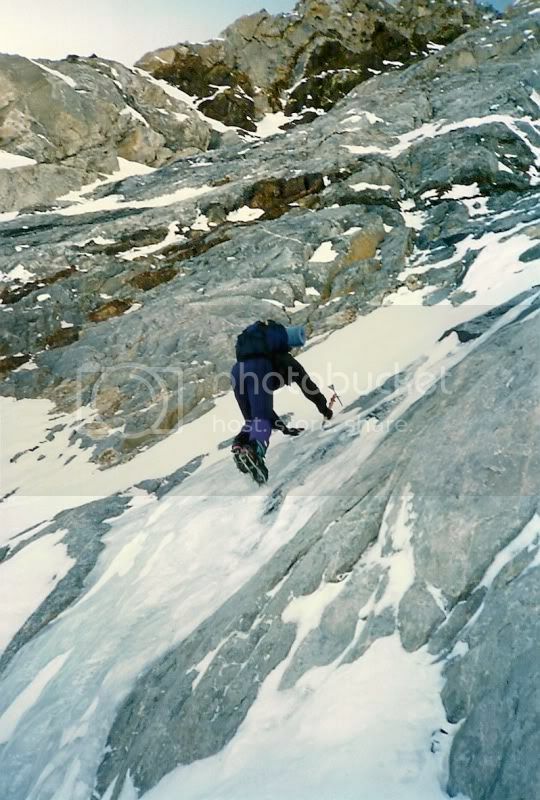 The reason I bring this up is that it if there's snow in the gully, either bring crampons to avoid sections of climbing more difficult than 5.2 -- or be aware that you may face up to 5.7 (loose) rock. The left side of the gully might have been easier -- I don't know. Fortunately, I had a big margin of error, and I take responsibility for my actions. I just don't want anyone else to find themselves in over their head. The instructions and photos in the SuperTopo eBook are fantastic, particularly given that this is such a tough route to describe. there is some beta on the Forum on this site. Just hit the forum button, then search for "laurel". Paul. 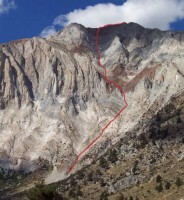 The route as seen from Convict Lake.